photograph by Whitney Joiner. Tim Roberts, Texas Parks & Wildlife cultural resources coordinator, at the “Cave of the Masks” in Hueco Tanks State Park. Hueco Tanks State Park, east of El Paso, contains an ancient rock art legacy unlike any in West Texas, or in North America. 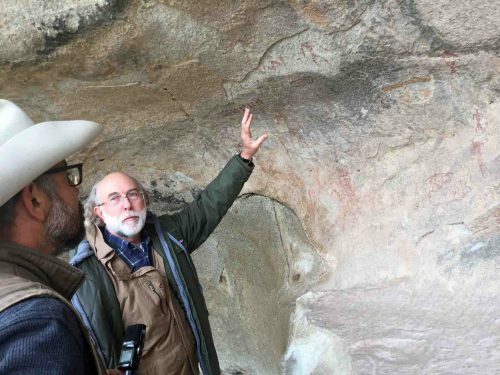 Thousands of painted images on stone outcroppings suggest this was a place of tremendous importance, of sacred significance, to earlier Chihuahuan Desert people. But it wasn’t just a place of ceremony. It was also a habitation. Humble, more subtle than the painted figures and faces, sites across the park preserve traces of the daily life of those who created these images. Archeologists call this society the Jornada Mogollon, and they’re working to preserve and document its record here. The Jornada paintings at Hueco Tanks are tucked into shallow caves and crevices – and include images of rain gods, storm gods. It’s the art of a desert people who’d embraced agriculture. The tradition began around 600 CE, and lasted some 800 years. The Jornada stretched from the Guadalupe Mountains to present-day Las Cruces and northern Chihuahua. They grew corn, beans, squash and other crops. And, of course, they cooked. That’s Tim Roberts, Texas Parks and Wildlife’s lead archeologist in West Texas. In fall 2018, he and his team were recording hearths like this – cooking sites – at Hueco Tanks. In one small area, there are 70. Past livestock grazing turned grasslands here to shrub, intensifying erosion. Roberts’ team wants to locate and document hearths before they wash away. There are the blackened rocks used to ring fires. But other artifacts are also exposed. Pottery fragments – painted, or in simple brown – abound at Hueco Tanks. Indeed, the Jornada can be identified by ceramics. The Jornada needed pots to store seeds and farming surplus. And they needed pots tempered with rock fragments to cook. They traded for pottery, from distant points. But the Jornada also manufactured their own. A utilitarian style called El Paso Brownware was used for centuries. The Jornada also created “El Paso Polychrome.” These ceramics – painted in bands of red, black and brown – were used for non-cooking purposes, in bowls, jars, pitchers, ladles and more. With its natural reservoirs – its “huecos” – Hueco Tanks is an oasis. But evidence shows the Jornada’s resourcefulness in raising crops in an arid land. Hueco Tanks was the site of at least one village. In the 70s, archeologists excavated the remains of a hamlet of pithouses – structures built within shallow pits, with walls rising above the ground. It was erected around 1100 CE. The dwellings ranged from 50 to 250 square feet. The desert farmers and potters continued to rely on wild plants and animals. They trapped rabbits, mice, prairie dogs. And they adopted a new hunting technology, replacing atlatls – darts – with bows and arrows, to hunt deer, bear and pronghorn. Lithics – the debris from stone tool-making – surround the hearths. There’s more to discover. Roberts hopes to excavate hearths. Charcoal samples could date the sites. Microscopic plant remains could reveal more about what the Jornada ate, and the fuels they used. Visitors come to Hueco Tanks for the stunning rock art. Beneath their feet are quieter signs of a unique society, that fused agriculture with ancient desert ways.